Moving home need not be a stressful occasion. Here we have compiled a a few pointers to make your move as simple as possible. Following these guidelines will help you get the most out of your removal day. Assess the amount of things you will be packing and be sure not to underestimate how many belongings you have. It comes as a surprise to most people at how much “stuff” they have accumulated over the years. Check the condition of your goods. Checking the condition of your before and after the move will give you piece of mind that we have done a great job in safely delivering your goods. Many people make the mistake of only checking the condition of their furniture and so on after the move. 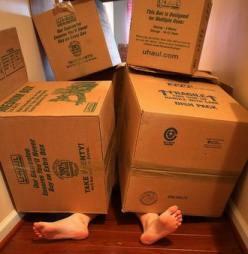 When packing your belongings for the big move be sure to use stackable sturdy boxes. To save you having to pay for a second trip we try to use every inch of the removal vans space, securely strapping packed boxes from top to bottom of the vans. Ideally the boxes should be of similar sizes. This helps to maximize the payload of the removals van ensuring no space is wasted. This is more of a priority if you have a lot of small items such as pots and pans, ornaments, entertainment equipment and so on. 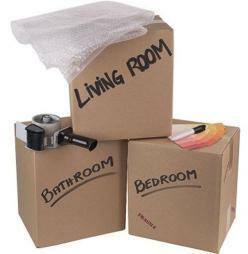 We advise you label your packed boxes stating the contents and to what room they need to be placed in. Not only does this save us time but it will free you of the hassle us asking you over and over again “Excuse me where does this box go” Even we get tired of hearing us asking this question. A house on the move is a busy house. Whenever possible try to keep small children and pets away from any of the rooms that are being moved and their access routs. Have an essentials box that we can load last and unload first at your new home. This could include Food, Drinks, Kettle, Teabags Toilet roll. Handy, especially after a long journey. Make a list of what each box contains. You cant unpack everything at once and no doubt you will be looking for a particular something during your first few days. To some, moving home is a daunting prospect. Sure its hectic with lots going on but your Big move should be a happy stress free event. Contact us today to arrange your stress free move. Our friendly staff are always on hand to answer any of your queries. We're here to make your move a happy & stress free move. give us a call. "As a first time customer of a star removals our experience has been excellent. All our moving worries have been taken care of by a very professional service.. Thanks and would recommend 100%"